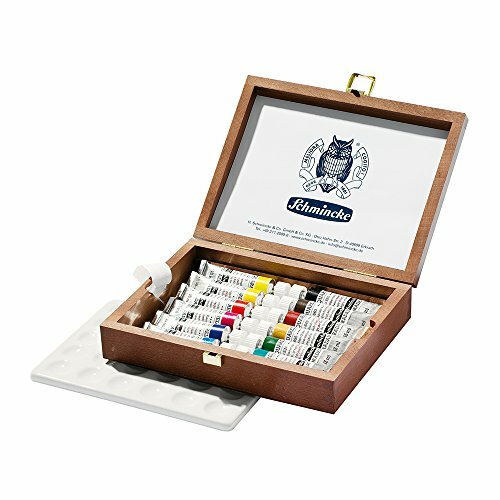 The Schmincke Horadam Aquarell 15ml Paint Tube Metal Set features superior quality, natural ingredients that are carefully selected each year for every formula for highest optimization. These traditional formulas since 1881 are the same in pans and tubes and are used by classic artists like Emil Nolde and Oskar Kokoschka. An optimal amount of Oxgall enables the artist to decide (and not the paint!) as to where the paint should flow moist or stay dry on the paper. 12 colors included in set. Made in Germany. Porcelain palette also included.